Bullseye Roulette is a unique version of Roulette, with a fascinating twist. In normal Roulette, the results depend on 1 ball falling into one of 37 holes, but in Bullseye Roulette a total of 18 balls are dropped! Play takes place over the course of four rounds (see below for round by round explanation) - the 18 balls are dropped into a traditional roulette wheel, numbers are eliminated and the last number remaining is declared the winner. As with 'normal' Roulette, the enjoyment comes from the variety of winning outcomes you can bet on e.g. if Red 25 was the last number then the winning bets would be 25, red, odd, 19-36, highest third, first column. But remember that Exchange Games allow you to bet using betfair's innovative betting exchange, so you're betting against other punters, rather than just the casino! Bullseye Roulette can seem a little confusing at first, but once you start playing, it's extremely addictive, especially in the Turbo version where the action is 25% faster than the standard version! Before the game starts you can place all the usual Roulette bets - Single number winner, colour of winner, column of winner, the third of the winner, 1-18 or 19-36 and odd or even. At this stage, the Roulette Wheel and Table look the same as any standard Roulette game (see image). But then the funs starts! Eight (yes, eight!) balls are dropped into the wheel. When a ball lands on a number e.g red 7, the numbers either side of it are then converted into that number - in this case, black 28 and black 29 become red 7, creating a long block (3 spaces instead of 1) which all count as red 7. This process continues for all 8 balls, after which a mix of numbers will have been eliminated. This is where it can get confusing! This image shows the state of the wheel and the table before the start of Round 2 - you'll notice a long block of Red 7s on the wheel and see that numbers have been eliminated from the table. At this point, you're able to change your mind or reinforce your opinion. Five more balls are dropped into the wheel, again converting numbers as they land and eliminating numbers. You can see now that the block of Red 7 has extended, but is now joined by a block of Black 17 and a block of Black 24. You'll also see that only 10 numbers remain on the table - making your betting options slightly easier! Seeing the takeover of the board by either a number or a colour is fascinating and compelling, and the speed at which it happens is mind-boggling - especially in Turbo games! But bear in mind that every change of the board means a change in the betting odds. In Round 3, three more balls are dropped into the wheel to narrow the numbers down to just a handful. You'll see now that almost half the wheel is Red 7, with long blocks of Black 17 and Black 24, and one solitary Red 1. So you now have only 4 numbers to bet on, but each number has a significantly different chance of winning. You can still bet on Red or Black, of course, or use one of the Dozen bets, but think carefully about the possibility of each bet winning, given the numbers left on the wheel, as opposed to the board. This is now your last chance to bet (Back or Lay) but your choices should now be fairly clear - and the exchange will reflect that, giving you the chance to play safe and go for the obvious (eg Red 7) or bet big on an outside bet (eg Red 1), hoping to take someone to the cleaners! In the final round, two more balls are dropped into the wheel, the final conversions take place, the winner is declared and all bets are settled. In the example we've been following (right) you'll see that Red 7 did indeed win, as you might have expected, meaning that bets on Red 7, Red, Odd, 1st Column and 1st 12 all pay out. But as with all betfair Exchange games the excitement comes not just from selecting the right bet at the start of the game, but second guessing other gamblers, sniffing out opportunities for either big or small wins! In essence, you're backing your judgement against other gamblers, some of whom may not be as familiar with the game as you and who may be tempted into making incorrect decisions, based on a lack of understanding of the differences between Bullseye Roulette and the traditional game. 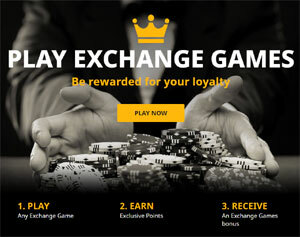 As discussed above, betting on the exchange gives you a lot more scope than with normal casino gambling. Whilst it's tempting to try to play Bullseye Roulette in the same way as standard Roulette, the best betting opportunities don't come from trying to win big odds on a single number, but by trying to outwit other gamblers, who will generally follow the obvious bets. In other words, if it looks likely that Red will win, the best odds will be found by betting on Black at that point. Because of the four round nature of Bullseye Roulette, it lends itself to using the 1-3-2-4 betting system on one of the evens-chance bets (Odd / Even, Red /Black). You could follow the sequence through for as long as your bet is still alive. In this case, though, you have the opportunity to change bets after each round. For example, if you choose Red for your initial 1 unit bet, but then see a better opportunity on Black after round 2, your 3 unit bet could then be on Black. As with all Exchange betting, it's beneficial to keep your wits about you, and not be afraid to change your mind once the game starts! If the above has whetted your appetite, and you'd like to give Exchange Bullseye Roulette (or any of the other Exchange Games) a spin, just click on the link below and we'll take you straight there!